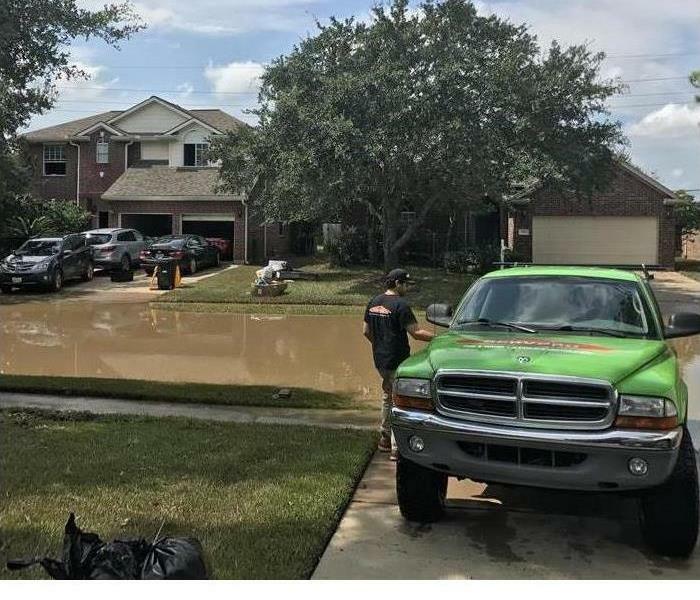 A storm caused a neighborhood to flood, SERVPRO was there immediately to help. SERVPRO of Baytown/ Channelview understands storms are unpredictable and arrive fast. However, In most cases, weather reports keep us informed with storm updates. This allows us to prepare ourselves, our homes and our belongings for the natural disaster that's approaching. We want you to be ready for any storm that comes your way, so here are a few tips we have to offer! Assure the safety of you and your family. Stay updated on all news reports of the storm to properly determine the next step to take. In some cases, you may have to evacuate the home, in other cases, you may have to determine the safest place in your home to stay while the storm is passing through. We Suggest preparing a home safety package. This would include things like flashlights towelettes and a supply of non-perishable foods. We highly recommend filling all your cars up with gas. Depending on the extent of the storm you may have to evacuate your area immediately. It's important to be ready to go if that time comes. This apartment complex in Austin, TX experienced extreme building damages. If you have property damage and plan to file an insurance claim to cover the cost, here are some helpful tips to keep in mind. Contact your insurance company immediately and file a claim. This will ensure you are assigned a claim number and adjuster who can review your damages and assist in rebuilding your property. Your assigned adjuster will be the representative from your insurance company who communicates what is covered by your individual insurance policy and determines the value of your claim. After you obtain your claim number, we recommend contacting our SERVPRO office at 281-219-8180. A team will be dispatched to your property right away to review, access and scope the damage. Additionally, we will discuss the process of restoring your property back to its original condition. SERVPRO specializes in exterior and interior fire and water restoration services. Once your insurance claim is filed, contact SERVPRO immediately. Our team can assist with nearly all property damage repairs and will communicate with your adjuster for a swift restoration process. Always document your claim with clear photos, it's important to have detailed photos of the existing damage. One of the standards that sets SERVPRO apart is our dedication to documenting all aspects of property losses to be able to share our photos, sketches and journal entries with insurance companies. We are highly acclaimed among insurance adjusters for our thorough process of documenting all aspects of mitigation, remediation and reconstruction for insurance claims. 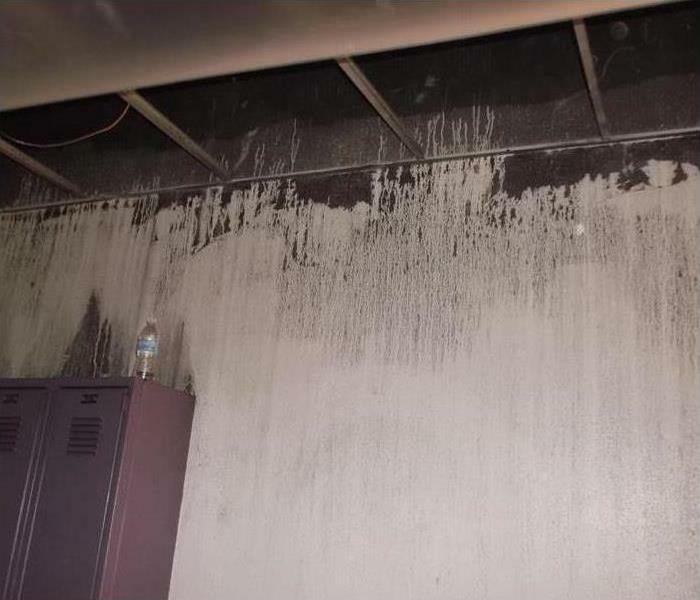 This facility suffered water damage due to a fire loss. Water damage is closely associated with the mitigation of fire loss because of the immense amount of water firefighters use to extinguish a fire. Unfortunately, water has the nature of wicking to dry. In other words, when the fire department sprays the water hose on the affected area, the carpet, walls, room framing and structure can absorb the moisture as well. Depending on the extent of the fire, water could also travel on the ceiling. When confronted by water damage, drying the structure is your first priority. The drying process includes extracting standing water by utilizing our specialized equipment to absorb the excess moisture and circulate the dry air in the room. Our specialized equipment paired with our expert IICRC certified crew technicians provide optimal, timely and efficient drying. Ensuring the structure is completely dry prevents any future damages that can occur when moisture goes unaddressed. Mitigation is key to reducing the loss of building materials and restoring the building quickly. Time is essential for mitigation. The longer the water sits in the building, the higher chance of increased loss on the property. SERVPRO’s top priority is to save any building materials including: drywall, insulation, wall framing and flooring that was not affected by the fire. This floral shop experienced severe fire damage. When fire damage affects your business, it can be an emotional and uncertain time. Our best advice is to get a trusting professional on your side who understands the immense amount of stress and worry that comes with property damage. If your property is ever affected by a fire, here are some helpful tips. Contact your insurance company and file a claim. Once you receive your claim number, request the assigned adjuster’s name and phone number and keep it on file. Contact SERVPRO immediately. Instant communication allows us to immediately come to the scene and begin Building Emergency Services which may also be referred to as “mitigation service” by your insurance company. When a fire effects your building the fire department will use water to put the fire out. The water then can be trapped within the walls, wood framing and under the flooring. It is important that your building is “dried down” not only for the safety of those who will be working to restore your building, but also to save any building materials that may otherwise need to be replaced due to prolonged water damage. Building Emergency Services include extraction of standing water on the floor, removal of any absorbent flooring materials and removal of moisture from the walls with our specialized drying equipment. Once the structure is dry and safe to work in, the next step is removing any debris caused by the fire, including effected flooring, drywall, insulation and furnishings. After the room has been cleared, the remediation process begins. The remediation process includes appropriate cleaning, the structure, walls, ceiling, floors and HVAC system. During this process, SERVPRO tries to reduce the cost of your claim by remediating any of your property that can be saved instead of replaced. Once the building has been remediated, the rebuild portion of your claim begins. Rebuild includes the reconstruction of any area of the property that was too far damaged to be cleaned or repaired. This could include, the installation of new drywall, insulation, ceiling tiles, flooring and any other necessary materials. SERVPRO communicates directly with the adjuster to create a schedule and review the damages to determine the best process for repairing your building. Mold can grow anywhere if moisture and organic material are present. Mold spores are everywhere, and an environment that has everything necessary for fungi to thrive runs a high risk of developing a mold problem. Mold can start growing in as little as 24 to 48 hours after water damage. Take these four steps to stop mold growth at a residence in Baytown,TX . Lowering moisture levels is the single most important mold prevention method. Mold requires moisture and a source of food in order to grow. Extract excess water introduced to a residence from any source and run a dehumidifier to draw out residual moisture. If your home has recently experienced water damage, it may be advisable to schedule a mold test. An environmental hygienist or mold specialist can take air or spore samples to determine which species of mold are present and determine the extent of an infestation. If less than 10 square feet of visible, non-toxigenic mold is present, a homeowner can take steps to clean up and prevent the damage. It is advisable to seek assistance from a mold damage remediation service for a widespread infestation or one involving hidden mold or toxigenic species. Mold prevention and remediation experts can recommend which materials can be cleaned and which should be torn out or disposed of and replaced. In general, hard surfaces with superficial mold are better candidates for cleaning than porous materials such as carpet or drywall. These steps can be useful for stopping mold growth at a residence in Baytown,TX . 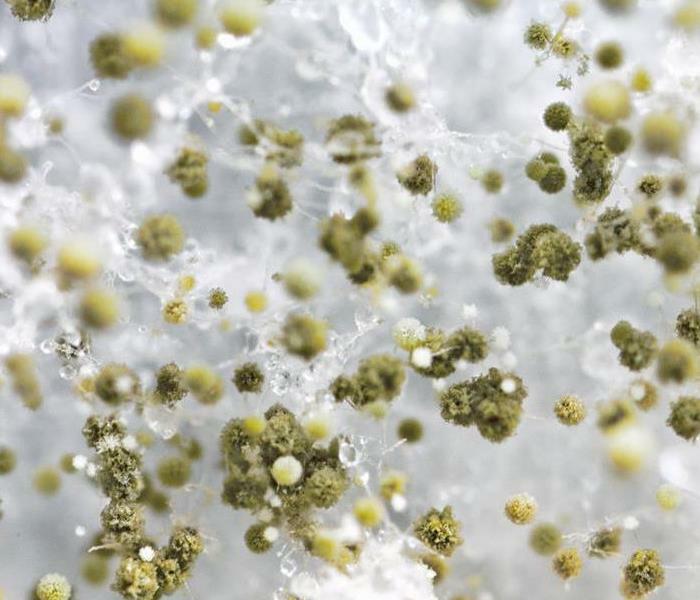 While mitigating water damage and reducing moisture may be enough to slow or stop active growth, mold spores may continue to pose problems or spread to more advantageous areas until existing colonies are eliminated. Homeowners may be unsure what to do after a residence suffers water damage from a broken pipe or any other cause. The most important measures include eliminating standing water, cleaning and disinfecting the area if necessary, and promoting drying. There are four things homeowners should avoid doing to limit damage and personal risk. Standing water can severely damage any structure. Water left standing will also become more contaminated. Clean Category One water emitted from a broken pipe can degrade to contaminated Category Two gray water within 48 hours. Contaminated water in home requires disinfection, whereas Category One damage can simply be dried. The risk of electrocution increases if a leak takes place near electrical fixtures, plugged-in appliances, or electrical wiring. 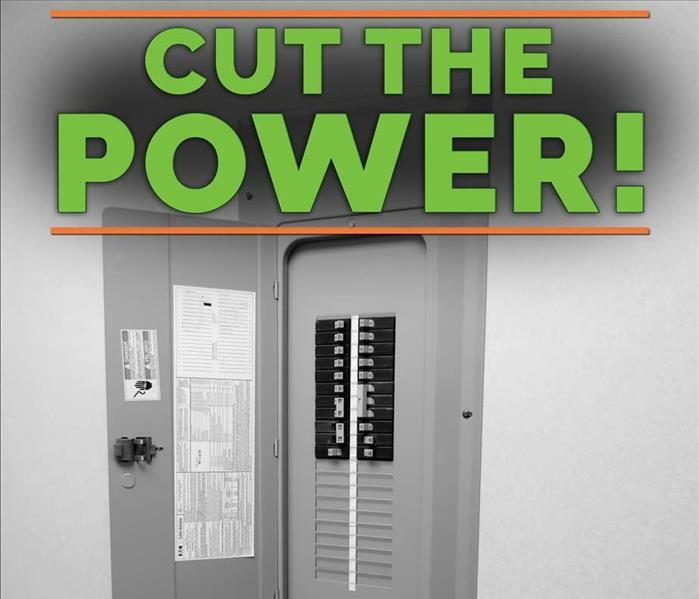 The best way to limit this risk is to shut off the power at a breaker box. If water damage is present near this panel, contact the power company or an electrician. Heavily contaminated Category Three black water from a sewer backup or flooding may contain solid waste and other potentially dangerous substances. Even Category Two water may contain microbes or chemicals. It is advisable to wear personal protective equipment or hire water damage cleanup professionals. High moisture levels that persist after any category of water damage will increase the risk of mold growth. Fungi require nutriment and moisture in order to thrive. Run a dehumidifier to lower moisture levels in the air and dry out porous materials. It is important to avoid doing these things after discovering a broken pipe or another source of water damage in a home in Channelview, TX. Each of these factors contributes to property damage or personal risk. The best way to avoid these factors is to contact a water damage mitigation and restoration service. Business owners generally purchase property insurance for protection against minor damages, but some don't understand that additional coverage is necessary for disasters, such as fire. While some industries are at high risk for workplace fires, just about any Baytown, TX, business should consider the benefits of fire insurance coverage. Your business may be home to some of the most common fire risks. According to the National Fire Protection Association, fire is the primary cause of property damage losses. In a typical year, fires cause several billion dollars in property damage. For a small business, a fire could mean the end of operations. The losses involved in damage to the property aren't the only problem. Fire departments may charge for their services. In addition to losses from fire restoration services, smoke cleanup, water removal and remediation services, business owners must worry about losses due to not being open during the restoration period. A lot of money is lost in paying employees and rent during a period without revenue and additional costs may be accrued because of moving the business to another location while the fire is sorted out. Without an appropriate fire insurance policy, small businesses may not have the financial resources to survive this situation. A business property policy may cover the costs of machinery, equipment, and furnishings. (Make sure you know the difference between actual cash value versus replacement costs.) A business interruption insurance policy offers protection from losses related to lost profits and the cost of continued operations. Fire insurance usually covers physical damages, the repair or replacement of office fixtures, lost income, and operational costs during the restoration period. Discuss your coverage with your insurance representative and fire restoration professionals for the best results. Small businesses in Baytown, TX themselves from many hazards with well-thought-out insurance coverage. Water is sort of funny. When it stays where it is supposed to stay, you probably don’t think much about water. When it leaks into other areas, though, water can be impossible to ignore. If you want to preserve the condition of your Baytown,TX, home, you must take your shower or bathtub leak seriously. One of the most common bathroom leaks is a shower pan leak. To see whether your shower pan has a leak, plug the drain completely. Then, fill the shower pan with water and note whether it drains. If it does, there is a good chance you have a leaky shower pan. Bathtub and shower drains cause problems for homeowners all the time. While you may know how to deal with a clogged drain, you may not realize drains can leak. If you can see your plumbing system, you can likely look for signs of water spillage. If you can’t, you may need to a plumber to tell you whether your shower or bathtub leak is due to a drain problem. When water leaks, it generally leaves minerals, discoloration and other signs behind. If you haven’t noticed that your bathtub is incapable of holding water, these indicators may tell you that there is a problem. After you fix the leak, you must think about restoring your home to its pre-leak condition. Because mold grows quickly in wet areas, you may want to ask a professional mold remediation specialist to inspect your home for signs of mold growth. 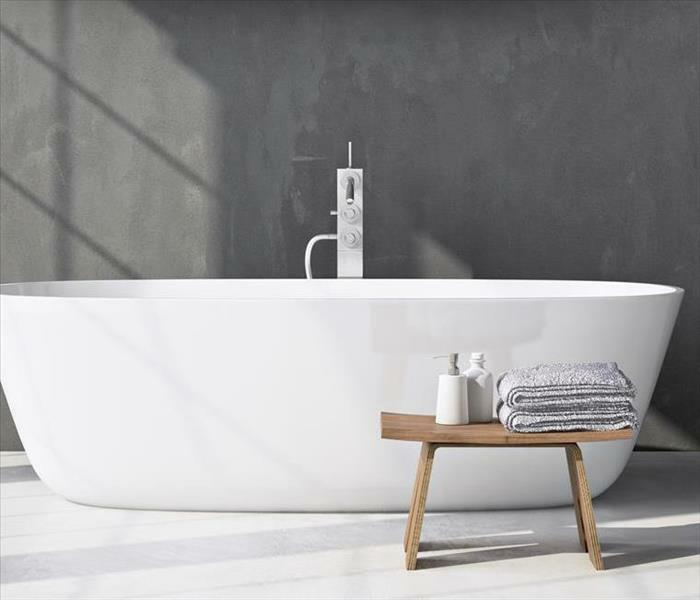 While you probably don’t want to think about a shower or bathtub leak, you may not be able to avoid one forever. By understanding how to find bathroom leaks, you increase your odds of catching and stopping the leak before it does significant damage. You don’t like to dwell on it or think about it, but the possibility of dealing with a house fire is a reality. This is why you have insurance and put in place as many safeguards as you can to avoid this tragedy. Still, if the unthinkable does happen, you want to trust your fire cleanup to a trained expert who knows who to preserve or restore your home and belongings. The best professionals can even clean up your electronics. If you notice during the fire cleanup process that some of your electronic devices fell victim to smoke, you shouldn’t take on the responsibility to clean it up yourself. An experienced technician will use tried and true methods to safely inspect and restore your device. If you’re not careful, you could not only cause more damage to the equipment, but you could harm yourself as well. The professionals employ dependable techniques that will preserve the items without compromising it or anyone in your home. One should only use the most specialized equipment available to clean up electronics. Fortunately, a dependable professional will come to your home with advanced tools and methods. The technician will act promptly. Your best course of action is to back up the memory of computers and to unplug all electronics. There’s cause for concern during a fire and fire cleanup. You can breathe a sigh of relief knowing a professional will treat your electronic items with care and may be able to salvage these important items. Category 1 water loss can cause a lot of problems. It can cause damage to the walls in your commercial property in Cloverleaf,TX, make your floors buckle and render a space unusable until the damage is repaired. While water mitigation specialists don’t necessarily need to sanitize an area flooded by clean water, there are still several steps in the water remediation process. The first things technicians will do is make sure no electricity is in contact with standing water. They may shut off the breakers to the area completely, depending on how much water loss has occurred. Any damaged drywall, particularly if it’s on a load-bearing wall, must be identified and, if necessary, fortified to protect the structural integrity of the building. Technicians will likely secure the area before they begin the actual cleanup process. The water source must be shut off so that no further damage occurs. All standing water must be pumped out of the area. Excess water is extracted from carpet and carpet pads. All items that are waterlogged by a broken pipe must be thoroughly dried or, if they cannot be salvaged, thrown away. The area needs to be dried thoroughly to prevent secondary damage, such as mold growth, from happening. To do this, industrial fans may be brought in to increase airflow to the area. This speeds up the drying process and helps control humidity so that excess moisture doesn’t linger in the air. Once the area is dried, any items or parts of the structure that had to be removed can be replaced. It’s a good idea to choose a remediation company that finishes the whole job by providing restoration services as well. Clean water can still cause significant damage. Let certified experts help restore your building to its original state.